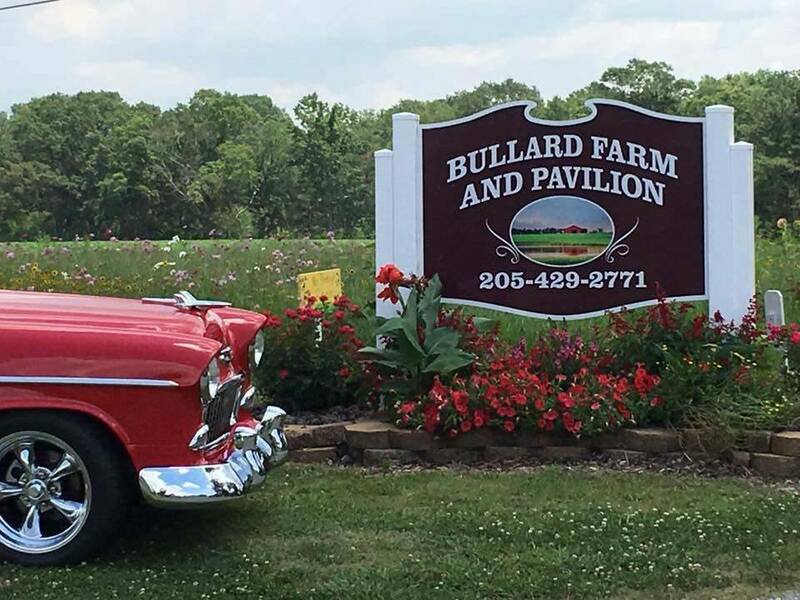 Bullard Farm And Pavilion is located in Snead, Alabama, and is the perfect country setting for weddings, birthday parties, reunions or any type of country themed event. There is a cedar swing out by the lake for relaxing and watching the gorgeous sunsets or it can be used as photography opportunities. There is also a picturesque spillway that is very eye catching and makes a beautiful setting for photos. A beautiful covered pavilion is available to use for receptions, meals, parties, and other activities. Our beautiful new barn style building “The Hitchin’ Post opened up in Spring 2018 and is staying booked with weddings receptions and all kind of events ! We have everything you will need.. Kitchen, restrooms dressing rooms shower Heat and AC . several lovely wood tables we built ourself to use for cake table,or bride and grooms table or anything you wish to use them for ..huge front porch with rockers and swings a balcony,tables chairs and tablecloths .. a beautifully decorated barn style building with a vintage rustic look. "The Hitchin" Post" will be a very memorable wedding venue !! A mix of Country charm and elegance .Large event area and stage.. ..it's a dream wedding come true !!! Owners Jerry and Jo Ann Bullard built a pavilion on their farm in rural Blount County Alabama as a backdrop for Jo Ann's concert and music videos. Word soon spread and the popularity and demand grew for other social events to be held on the farm as well, such as weddings, parties, and family reunions.